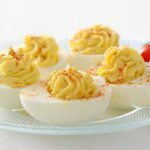 boiled Eggs), we’re back to enjoying deviled eggs again, and this recipe is our favorite. It’s always a hit at gatherings, and the eggs go fast. One reason I like this recipe so much is that it uses lots of herbs for flavor, and you can substitute fresh herbs for the dried if you have them on hand – simply use triple the amount of fresh herb for the dried. It’s a good idea to make the filling a day or several hours ahead to allow the flavors to blend. 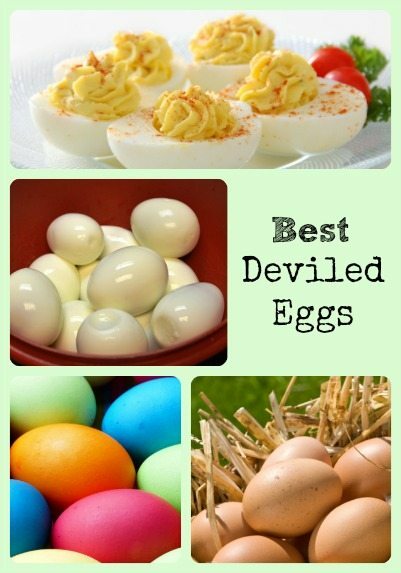 Of course, this is a great way to use all those colored eggs around Easter time – maybe even a good reason to color eggs! Slice the eggs in half (lengthwise). Put the yolks in a mixing bowl, and reserve the whites for filling. Mash the yolks well making sure to remove all lumps, and add the remaining ingredients. Mix well to combine, taste the filling, and adjust seasonings if necessary. Pipe the yolk mixture into the reserved white halves, and sprinkle with paprika.